London: Croom Helm, Ltd.,. Hardback. 190pp. 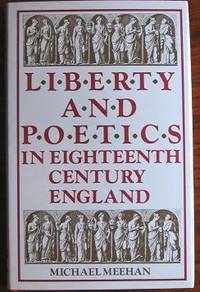 A study of the poetry of the eighteenth century along side the philosophy that influenced it. Covers the Augustan period and the Enlightenment and ends with a chapter on Wordsworth and the start of Romanticism. The reading is a challenge to the Whig version of history. Clean and neat with minimal wear. Very good copy in very good dw. . Hardcover. 1986. London: Edward Arnold,. 224pp. A selection of critical opinion from the seventeenth and eighteenth centuries. Critics covered include: Sir Joshua Reynolds, Joseph Warton, Edward Yound, Richard Hurd etc. Some reading and edge wear. Good, sound copy. . Paperback. 1971.